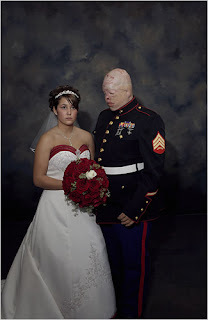 This is Ty Ziegel's wedding portrait: It was taken after his return from Iraq, and extensive reconstructive surgery, by a photographer on assignment with People magazine, who had several days to get to know the couple, and had their cooperation. The photo won the World Press Photo competition for portraiture in 2007, and the couple has cooperated with the media since, as part of the Ziegel family's attempts to improve services for other wounded veterans. (Ty's brother deployed to Iraq after Ty came home.) However, some found the image disturbing, and assumed it must have been published against their will. Because they didn't see how showing a wounded soldier would support the troops.